UNBIASED, MEASURABLE assessments of scholarship provide a means for tracking research performance and trends. They can be used to measure the scientific productivity of an individual researcher, a collection of researchers, an institute such as EOS, or even an entire university. It is gratifying that several independent metrics quantify what we all believe from our own experiences: EOS is a flourishing research powerhouse comprised of individuals and groups of world-class scientists. Here are some numbers—all for calendar years. The just-released "Web of Science (WoS)" metrics for 2015 reveal an impressive, continued upward arc of research output by EOS researchers. WoS surveys all peer-reviewed journals worldwide and counts each publication (a primary measure of scientific productivity), including authors and how/who cites those papers (which is a measure of scientific impact). In 2015, EOS scientists authored 234 publications, surpassing the 229 from 2014, which was already a record-smashing year. These numbers represent an approximate 30 percent growth in the overall EOS publication rate from a decade ago, and approximately a doubling relative to 2000. These represent measures of outstanding productivity and upward trends with time. The scientific impact of these publications is equally impressive. In 2014, the number of citations of all EOS authored publications fell just shy of 15,000; in 2015, the number of citations exceeded 16,000 a growth of approximately seven percent from the previous year and another strong indicator of the prominence of EOS research. "SciVal" is a second independent organization that analyzes scholarship using similar objective metrics, but in a way that allows us to explore down to individual EOS authors with a comparison to all others at not only UNH but also to all institutions worldwide. According to SciVal, between 2010 and 2015, UNH's net scholarly output comprises 6,091 publications written by a total of 2,738 unique UNH authors. In that same time period, our 49 EOS faculty (approximately evenly split between research and tenure-track) authored 1,142 papers. Said another way, EOS authors, representing roughly just two percent of all possible UNH authors, accounted for approximately 19 percent of all UNH publications. Even more impressive, nearly all of our 49 faculty rank in the top 100 most productive authors at UNH, including 23 of the top 50, and 10 of the top 20. These and other metrics (including similar leadership in science impact) demonstrate how prominently EOS research factors into the overall published scholarship at UNH. Equally impressive comparisons with other institutions, demonstrate that we are not only leaders at UNH, but that we are also top-ranked internationally in many domains that define EOS. These facts are unassailable, yet are not commonly known nor regularly celebrated, all fueled by the institute's primary focus on research excellence. How do we accomplish such feats? It is through a combination of high performance on research projects that span small, focused, single-PI awards to large, and broad, multi-institution awards. You will find that this issue and recent issues of Spheres highlight the full range of project size, some great and some small, but all bright and beautiful, collectively contributing to the high overall quality of scholarly output of EOS. My own awards are a microcosm of EOS as a whole, from the small but productive NSF FIREBIRD-II CubeSat mission and Sun-to-Ice project, to the mid-scale NASA Lunar Reconnaissance Orbiter and Van Allen Probes missions, to the flagship NASA Magnetospheric Multiscale mission. Owing to this incredible wealth of projects, I am particularly grateful to EOS associate director David Divins (profiled in this issue), who's arrival in the Fall of 2015 has provided much needed breathing room for my own scholarly pursuits; thank you, David! As you read this issue of Spheres, please consider that these stories are representative of the larger body of work at the institute, which individually and collectively makes EOS an amazing research engine. Thanks to all in the institute for your contributions to that ultimate goal! Research assistant professor Kai Ziervogel arrived recently from the University of North Carolina-Chapel Hill where he was a postdoc and research associate in the department of marine sciences. Originally from Germany, Ziervogel graduated from the University of Rostock in 2004. 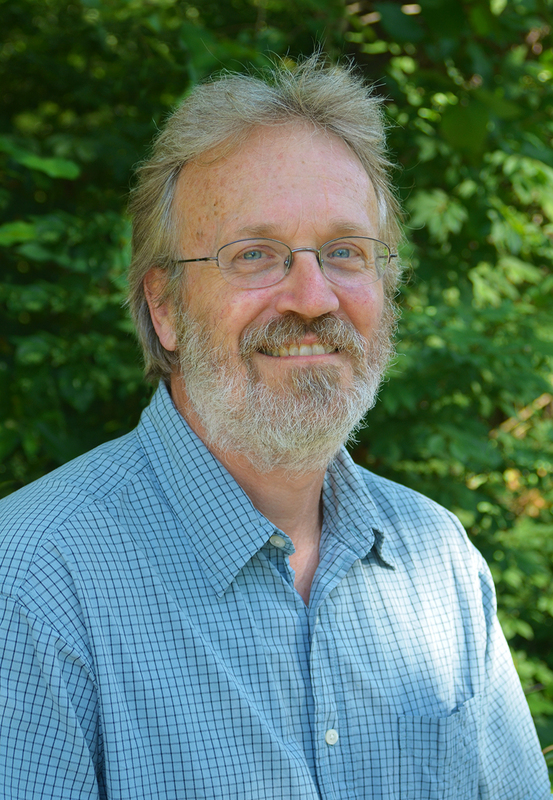 His research focuses on a key aspect of understanding food web interactions and the marine carbon cycle as heterotrophic microbial communities (organisms that require organic compounds for nourishment) transform photosynthetically produced dissolved organic matter into biomass, providing food sources for higher trophic levels. 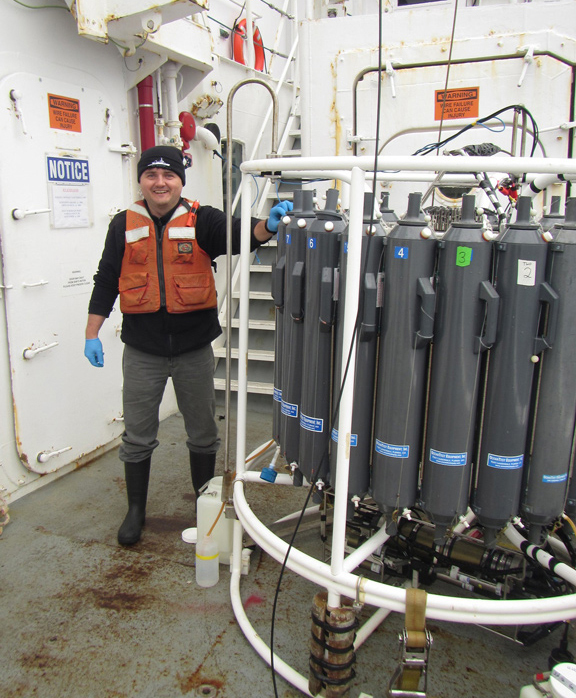 He is particularly interested in heterotrophic microbial communities associated with sinking organic matter aggregates, also known as “marine snow.” Read more about Ziervogel’s research in this Gulf Of Mexico Research Initiative publication. Director of the Northeast Consortium Chris Glass notes that graduate student Rachel Feeney successfully defended her thesis and graduated in December. 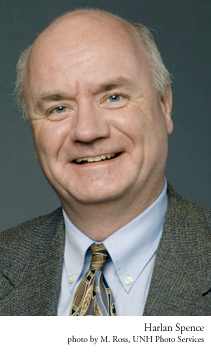 Feeney’s dissertation was titled “Catch Share Management in the Northeast Multispecies Fishery: Implications for the Commercial Groundfish Fishery in New Hampshire.” The work tests theories about catch share approaches to fisheries management, examines their validity and limits relative to the Northeast groundfish sector program, and potentially modifies them in light of research outcomes. Participants of the groundfish fishery based in NH are the particular focus of research, but broader impacts are considered. The Space Science Center team that designed and built the crucial Spin-plane Double Probe (SDP) for NASA’s Magnetospheric Multiscale (MMS) mission was recently named one of the recipients of the 2015 Robert H. Goddard Exceptional Achievement Award for Engineering (Individual and Team Recognition). The 16 probes (four on each MMS spacecraft) were designed to ever-so-gingerly pay out 60 meters (192 feet) of spaghetti-like, high-tech cable, at the end of which is an orange-sized metallic sphere that is measuring electric potential in the vacuum of space—a critical measurement for mission success. Morse Hall team members for the SDP deployer included Brian King, Mark Granoff, Pieter Beckman, Ivan Dors, Colin Frost, John Nolin, Aaron Bolton, Jon Googins, John Levasseur, Caleigh MacPherson, Dave Rau, John Salwen, Steve Turco, Phil Demaine, Todd Jones, Jerry Needell, Stan Ellis and Roy Torbert. Click here for more about the SDP work. 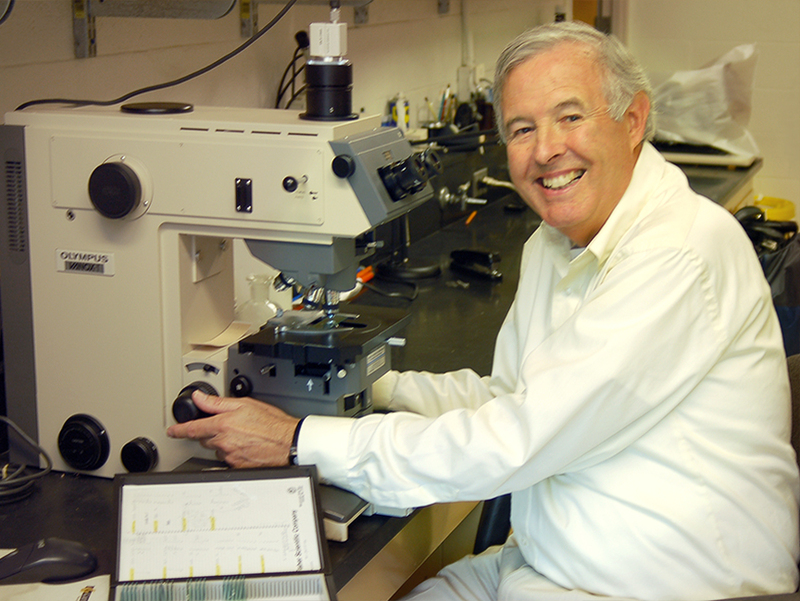 SSC professor emeritus Terry Forbes recently received the 2016 George Ellery Hale Prize from the solar physics division of the American Astronomy Society. The prize is given annually to an astronomer who has provided outstanding contributions to the field of solar astronomy. 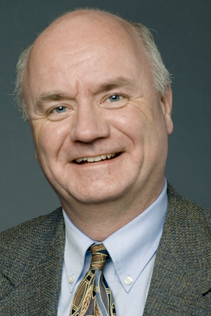 According to AAS, Forbes was recognized “for his significant contributions to the theory of magnetic reconnection, for his development of important new models of the physics of solar flares and coronal mass ejections, and for his achievements mentoring students and junior scientists in the solar physics community.” Read more in a recent article in Foster’s Daily Democrat. 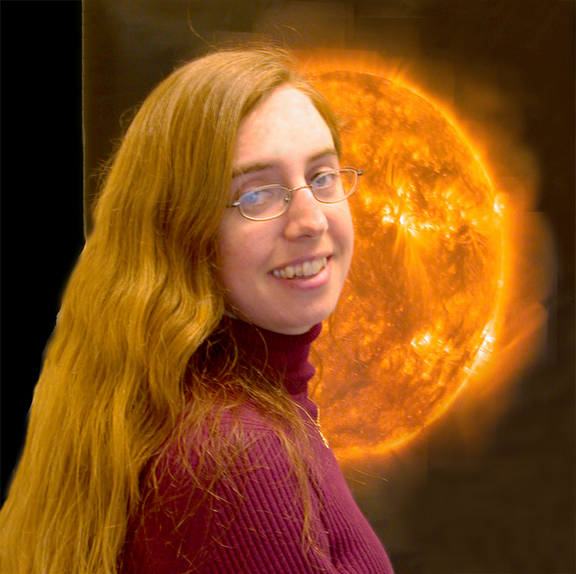 Also, Forbes’ former Ph.D. student, Katharine Reeves, received the 2016 Karen Harvey Prize “for her work elucidating the energetics of solar flares and coronal mass ejections, for her leadership within the multi-national Hinode/X-Ray Telescope project, and for her strong role in scientific education and public outreach,” according to the AAS Solar Physics Division website. 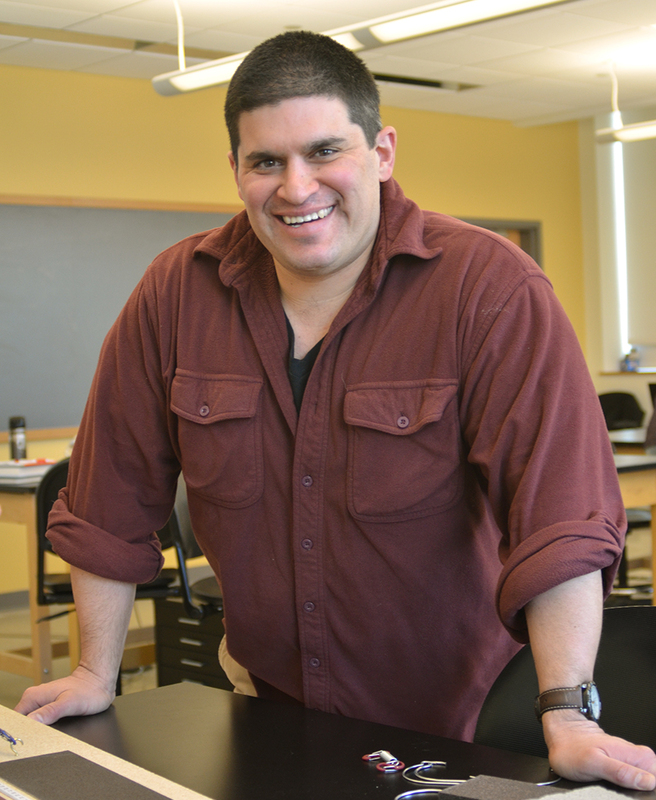 Reeves, who graduated from UNH in 2006, currently works at the Harvard-Smithsonian Center for Astrophysics in Cambridge, MA. Chuck Smith notes that two high school students involved in Project SMART 2015 continue to work in the SSC. One is completing a project on expanding flux ropes with Ph.D. student Kristoff Paulson while the other is working with Smith on waves due to interstellar pickup ions. 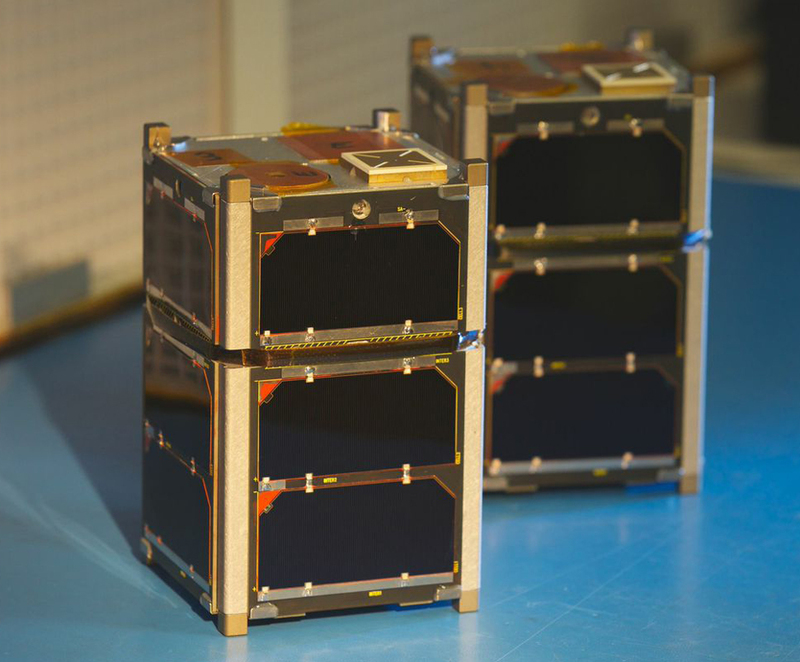 Harlan Spence and Sonya Smith note that on January 31, the FIREBIRD II CubeSats reached the milestone of one full year in orbit and 5,503 orbits completed. Both pintsized spacecraft are doing well, even now, well beyond their three-month mission lifetime goal. The FIREBIRD team is busy downlinking data from their 7th science campaign in which the instruments were operated in a new, faster mode. First publications are detailing newly discovered properties of relativistic electron microbursts. Joe Hollweg was appointed Honorary Professor with the School of Agricultural, Computational and Environmental Sciences at the University of Southern Queensland, Australia and serves on the committee of a Ph.D. physics candidate there. The student’s thesis is on radio studies of the solar corona, which was the subject of Hollweg’s Ph.D. thesis, and a topic that he has pursued occasionally ever since. Hollweg’s last paper on the topic was published in The Astrophysical Journal in 2010 in collaboration with Ben Chandran. 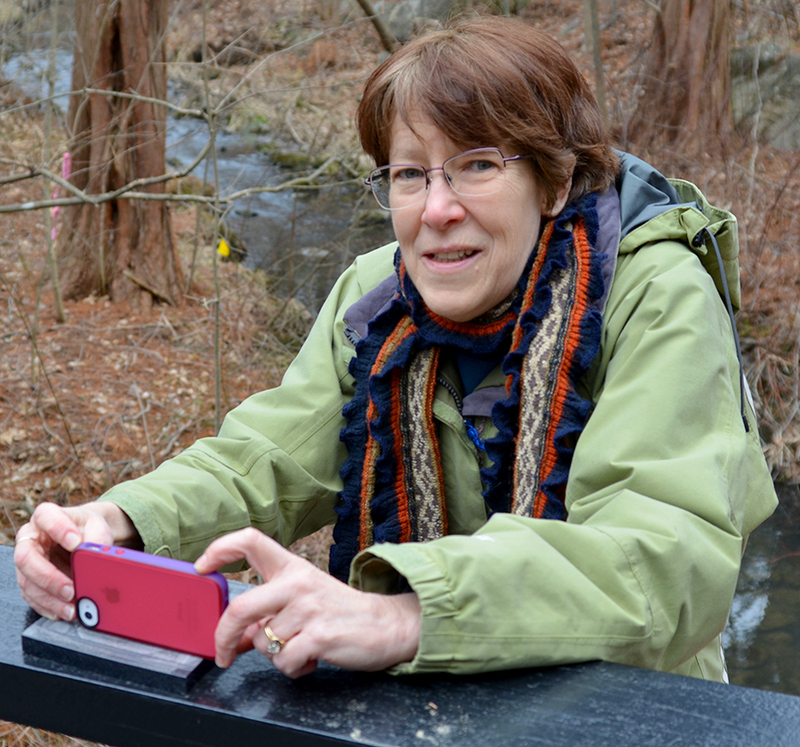 In March, Ruth Varner was named the recipient of the UNH Outstanding Associate Professor Award. 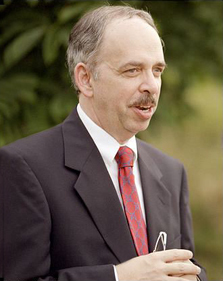 Steve Frolking was named a American Association for the Advancement of Science (AAAS) Fellow. Frolking, a research professor of biogeochemistry in ESRC and department of Earth sciences, was recognized for his contributions in understanding the Earth’s carbon cycle and its relationship to climate. Election as an AAAS Fellow is an honor bestowed upon AAAS members by their peers. Frolking was recognized during a ceremony for new fellows on Saturday, Feb. 13, 2016 during the 2016 AAAS annual meeting in Washington, D.C.
Research assistant professor M. Christina Jolejole-Foreman recently joined the ESRC with a joint appointment in the Carsey School of Public Policy—a first for EOS. She specializes in agricultural policy and international development, environmental economics, and applied econometrics. Jolejole-Foreman is an applied economist and her research has mostly been multidisciplinary in nature and encompasses the linkages and interactions among the areas of environment, agriculture and food security. 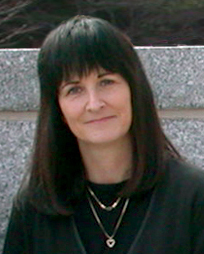 Prior to coming to UNH she was a postdoctoral research fellow at Harvard University. She earned her Ph.D. at the University of Illinois at Urbana-Champaign. Cameron Wake was appointed to the New Hampshire Coastal Risks and Hazards Commission. The commission was established in 2013 by legislation aimed at helping coastal communities and the state prepare for projected sea level rise and other coastal and coastal watershed hazards. NASA funded Jingfeng Xiao and Alexander Prusevich for a three-year, $540K project to develop ecosystem carbon indicators for the U.S. National Climate Assessment (NCA). Assessing the impacts of climate change on ecosystem carbon uptake and plant productivity has profound scientific, societal and policy implications. The development of clear and concise ecosystem carbon indicators is essential for future NCAs, the evolution of national-level policy regarding climate change, and better understanding of the feedbacks between the terrestrial biosphere and the atmosphere. Barry Rock, professor emeritus in the ESRC and the department of natural resources, is initiating a new K-12 STEAM (Science, Technology, Engineering, Art, and Mathematics) outreach program called WOW (World Ocean Watch). The WOW pilot program will be initiated in south Florida in the fall of 2016. Patterned after the UNH’s K-12 Forest Watch and the international Global Learning and Observation to Benefit the Environment (GLOBE) Program, WOW students will study a range of classroom and field activities focused on the impacts of sea level rise on the Florida Keys and the Miami-Dade School District. Rock is working with a team on Key Largo representing a diversity of interests. The art aspect of STEAM will involve students photographing, painting and drawing aspects of each project as a means of documenting progress and findings. Mark Twickler and Joe Souney report that on January 23, 2016, the South Pole ice core project reached its final depth of 1,751 meters (5,745 feet or just over one mile), recovering the longest ice core to date from the geographic South Pole. The combination of low temperature, relatively high accumulation rate, and low impurity concentration at South Pole will yield a detailed record of atmospheric trace gases from the ice core. The approximately 50,000-year-old ice core will also provide a record of the climate history of a unique area of the East Antarctic plateau that is partly influenced by weather systems that cross the West Antarctic ice sheet. Thus far, 555 meters of the ice core have been processed at the National Ice Core Laboratory (NICL) and samples sent to various laboratories across the USA for analysis. UNH's role in the project involves the planning of the fieldwork and ice core drilling at the South Pole, the coordination of the core processing and sampling at the NICL, and the overall scientific management of the project. The project is funded by the National Science Foundation Division of Polar Programs and is a collaboration between UNH, the University of California-Irvine, and the University of Washington, with assistance from NASA’s Goddard Space Flight Center. For more information visit spicecore.org. UNH Ph.D. students Ryan Cassotto (ESRC), Anthony Saikin (SSC), and Danielle Grogan (ESRC) all received Outstanding Student Paper Awards from the American Geophysical Union (AGU). The winners were notified in January following their poster presentations at the 2015 AGU Fall Meeting held in San Francisco December 14-18. 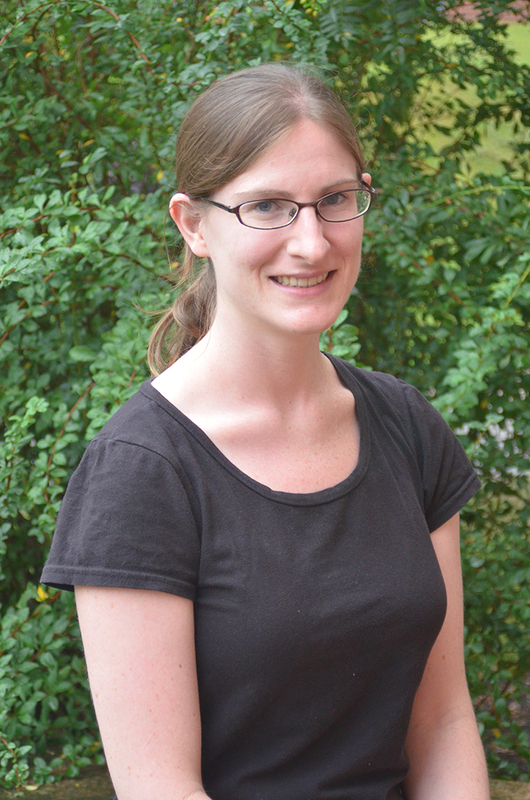 Ph.D. student Pamela Moyer (UNH department of Earth science) also received an award. Cassotto presented initial results of his research on the Columbia Glacier in Alaska showing how a major rain event re-invigorated flow along the glacier's termini and how the additional rain altered the response of the glacier's termini to ocean tides. Saikin's research focuses on the generation, spatial distribution, and wave properties of electromagnetic ion cyclotron waves in the Earth's magnetosphere. Grogan's work assesses the amount of groundwater that is used for agriculture globally and quantifies how many times groundwater is re-used by way of agricultural wastewater entering streams, rivers, and percolating back into aquifers. Mike Palace was lead author on the paper “Estimating forest structure in a tropical forest using field measurements, a synthetic model and discrete return lidar data” in Remote Sensing of Environment and coauthor on two papers in Journal of Biogeography and Global Change Biology, respectively.